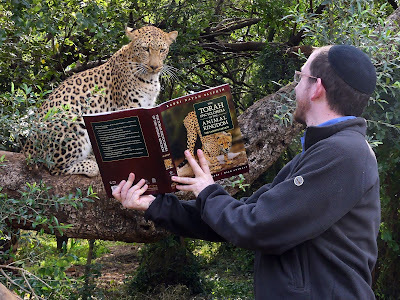 in the Torah, and a leopard suddenly appeared! In the last post, Rav Chaim Kanievsky and the Grasshopper, I discussed the "miracle story" of a grasshopper appearing in front of Rav Chaim right when he was learning the Gemara about grasshoppers. Well, this week, I had my very own similar miracle! 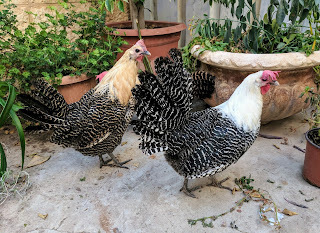 For many weeks, I have been heavily involved in the topic of the kashrus of different breeds of chickens. In part, this was because of the Feast of Exotic Curiosities that we ran at The Biblical Museum of Natural History, and in part, this was due to the controversy over the Braekel, on the topic of which I will soon be e-publishing an extensive monograph. But actually getting hold of a Braekel, dead or alive, proved to be extremely difficult. All 7000 birds that had been raised near Beit Shemesh were slaughtered. We were desperate to get even a slaughtered Braekel to serve at the Feast of Exotic Curiosities, and we were finally only successful when we sent a staff member to Bnei Brak. But, of course, the real goal was to get a live Braekel, to display at the museum as part of our developing "Kosher Birds" exhibit. And I hadn't been able to find one anywhere, and nor had my colleagues in the field, Prof. Zohar Amar and Moshe Rosenbaum, who had likewise been searching for one. Between us we have an extensive network of connections with various people raising exotic fowl, and nobody has a Braekel. I even started looking in the US to get fertilized eggs that I can bring back to incubate here, but while you can get hundreds of different kinds of chickens in the US, you can't get a Braekel! ...and the woman mentioned that they are raising Braekels at home! This family hasn't eaten chicken or eggs for ten years, ever since her husband decided that regular chickens are not a kosher type. But they managed to obtain some Braekels, which satisfied their kashrus requirements. Today, I got to meet a real live Braekel! And it also looks like I will be able to obtain one or two for the museum! Now here's the kicker. I am absolutely convinced that this string of coincidences is Divine Providence. Yes, I know that the Rishonim didn't believe that Divine Providence is so prevalent. Yes, I know all the reasons to be skeptical of seeing this as Divinely ordained. Call me anti-rationalist if you like. But I can't help how I feel! Stay tuned for my monograph on the Chicken Wars! 1/3 or so of all chicken eggs sold in the US are from Campine chickens because they tend to lay large white eggs. Campine is the American name for Kempishe Braekel chickens. (2) the effects of daas Torah and the concomitant distrust of experts in various secular fields -- without knowing the facts on the ground, expertise in theory cannot produce meaningful pesaqim. Not necessarily distrust of exprtts but rather using them from within a halachic framework and not as deciding factors because they are scientists. Where does the power to decide halocho lie, with the scientist or with the posek. We have the worlds' top halachicists arguing about the kashrus of birds far greater posqim than they ate. We're talking about a kind of chicken that was common in Germany in the days of the Maharil, R' Yaaqov Ettlinger, R SR Hirsch, and whose eggs were eaten by R' Henkin, R Moshe Feinstein.... I mean, no one questions that any poseiq of today would have to bow to the opinion of the Maharil, one of the Rama's primary sources. And now, suddenly, it's an open question? Or conversely, the chickens everyone else have been eating are? This is due to a lack of knowledge about the metzi'us that they are pasqening about. They don't know the hisroty of the Breakel chicken. "Min" is a halachic category, doesn't map directly to scientific taxonomies of species or breed. And as a halachic category, it is up to a poseiq to decide the limits of minim, and which are kosher. But he needs the input of specialists to know the history and biology (in particular biomorphism) of the birds they need to pasqen about. Just as a poseiq cannot decide whether a given person should or shouldn't eat on Yom Kippur without knowing what doctors think of his condition. Skeptic: yes and no. Halacha and all legal systems have their rules which can't be deduced from an investigation of nature. Nevertheless, there is also skepticism of modern science even in the realm of science which leads to less than optimal decisions where the science is important. The endorsement of anti-vaxx among Rabbis who are simply too smart to get it wrong if they were being objective proves the bias. Its just a money grab. Nothing more and nothing less. This family hasn't eaten chicken or eggs for ten years, ever since her husband decided that regular chickens are not a kosher type. It's been going on for that long?! I thought this was a new thing! and no coincidence that this was in today's Wall St Journal? Well, if you search for "The Science Behind Coincidence" you will find that article plus a bunch of others published at different times. That ups the chances of that coincidence. I love reading about coincidences like this. I've long believed that in this modern era, where science is capable of explaining nearly any kind of openly obvious miracle, that God chooses therefore to act through coincidence - so someone who believes will see meaning and someone who doesn't won't see anything. There have been plenty such anecdotes in my life, as I'm sure there have been in yours. It's of no halachic consequence, but it is interesting to think about from time to time as a source of inspiration. And the leopard is adorable. The goal of science is to provide a non religious explanation of the world. Thats its raison d'etre. So by definition Moshe rabenu was psychotic. The goal of science is to provide an empirical explanation of the how and causal "why" of how the empirical world works. It isn't out to answer questions of morality or ethics, nor teleology -- the "why" of the purpose of it working that way. Yes, there are some scientists who fell pray to scientism, the belief that the only real truths are scientific ones. But that's not what science is. Morality and purpose are what religion is about. See Stephen Jay Gould's Non-Overlapping Magesteria (a/k/a NOMA; the title in this sentence is a link). SJG, aside from being a popularist science writer, was also a paleontologist and evolutionary biologist. His is "a scientist's opinion" no less than the one you're assume is "science". Scientism (which is a real philosophical term, not just something coined for debates on this subject; again, the word is a link) might need to dismiss Moshe Rabbeinu as nuts. But actual science would admit that it has nothing to say about revelation. You are following for a basically pagan view of religion. As long as you think that the Torah is out to explain those parts of the world we can't explain, you have a "God of the Gaps" whose territory shrinks as the gaps in our understanding do. And so science is a threat. Your opposition to science comes from treating HQBH the way one would (lehavdil elef alfei havdalos) treat Thor. Thor disappeared the second lightning became a huge static discharge, rather than the power of his mighty hammer. Hashem and his followers don't have to worry about such things. Science is actually a product of monotheism, and advanced in societies that believed in a Creator. If not by the scientist's personal belief (eg Aristotle, Newton), then by the assumptions of the culture the scientist (such as Einstein) was raised in. When lightning is the product of a Grand Design, one has motive to study it. The pagan's explanation of Thor throwing a hammer at Loki or whomever doesn't motivate study to look for a design. There is no unified wisdom or design to look for. Science's power to explain doesn't threaten emunah. It motivates it. The more beauty we see in how the universe works, the more we realize His Handiwork. To the rishonim, it was the need for miracles that needed explaining, as it raises the question of why a Perfect Creator could only make a system that needed His Intervention. The Seforno's answer in parashas Bo is the need to respond to free will if He is going to let it be truly free. But the question historically dealt with is actually the opposite of the one taken for granted. And again, science's goal is to provide a non-religious explanation of the empirical parts of the world. Torah is there to provide a religious explanation to the non-empirical parts. Science provides the "substance" (in the hylomorphic, tzurah-vechomer, sense), Torah gives it a "form", function and purpose. Science doesn't represent the opposing team in life's soccer match; it is the mastery of the field we play on. Let’s say there’s a 50/50 chance if the event is a coincidence or it’s Divine Providence. If you’re truly rationalist, why choose Divine Providence? I don’t get it. I don't think that the Torah is out to explain those parts of the world we can't explain, I think it contains a complete explanation of all parts of the world, because ultimately the Torah is the world. Ein Od Milvado. It's just that this explanation may be different from what you experience. As the story with the Baal haTanya who once went into an inn and commented that it was not the wooden pillar that was holding the roof up but the Name of Hashem. All is really spirit. Science cannot as you note provide explanations of why, but it avoids that question by focusing on what. However it is still trying to provide a complete explanation of the world without recourse to external factors. The point of Einstein's theory of relativity is that things are relative to each other and not to any external force or energy field (i.e. ether). It is true that many scientists personally believe in a Creator, but the system itself is built to deny such beings, hence the vital importance of the big bang and evolution in providing props to explain a world that has appeared by itself and become what it is as a result of random processes. Science cannot see any non-empirical parts of the world, and de facto rejects their existence; scientific testing was conceived specifically to exclude their presence. It may motivate people like yourself to emunah, but I guess you would be considered a failure of the system. Science may have grown out of a monotheistic culture, but so what? Many of the early scientists were failed alchemists and keen to hide their occult work from a church that saw the devil in every corner (in itself an interesting story how this developed). They took care to provide only physical explanations, no hidden forces were involved. Newton carefully hid his mystical works for a reason. As far as the Nordic gentleman's disapperance, well Dovid Hamelech says 'כי כל אלוהי העמים אלילים"", all the gods are elilim, i.e. higher forces. They exist as beings in a spiritual state. Problems occur when they present themselves as having independant power (see the interesting story told by Barbara Brennan in Hands of Light) or when we attribute that to them, and begin to direct our worship to them. I could not find it now but I once came across an interesting tory of a modern woman totally unaware of mythology who underwent hypnosis and reported seeing a nordic chief crossing the rainbow in a wagon and when he banged his ax or drum it caused thunder. If you stop looking tho' you won't see him. There is also the story of the flood in Dvinsk which threatened to break the banks of the river. The mayor called in desperation on the Ohr Somayach who went onto the bridge and was heard addressing the 'sar shel yam' and ordering it to calm down by virtue of his authority as rov of the town. When several attempts failed he declared that if the sar did not obey he would place him in cherem, and the water immediately began to calm down. A little more on paganism. I think it is important to understand the historical context of terms like this before using them. Paganism was a term used by the church to refer to the older Greek religion. It does not have a direct Jewish context. Here is the Rambam in Hilchos Yesodai Hatorah ג' using distinctly 'pagan' ideas: יא [ט] כל הכוכבים והגלגלים, כולם בעלי נפש ודעה והשכל הם; והם חיים ועומדים ומכירים את מי שאמר והיה העולם, כל אחד ואחד לפי גודלו ולפי מעלתו משבחים ומפארים ליוצרם כמו המלאכים. וכשם שמכירים את הקדוש ברוך הוא, כך מכירים את עצמן ומכירים את המלאכים שלמעלה מהן. ודעת הכוכבים והגלגלים, מעוטה מדעת המלאכים וגדולה מדעת בני האדם. Part of the backdrop to science was to reject the 'pagan' idea that the world is a living place and substitute the idea that matter is simply inanimate stuff. The Torah is on the side of the pagans in this respect. . Left you some space for the explosion. There is a lovely story printed in Ner Yisroel from the holy Rhizhiner as a child a man came to his father and approached him as he could not wait. He had a problem with a rigged scale that the police were coming to investigate. The Rhizhiner heard his story and promised him all would be well. He returned a while later with a large gift for the Rebbe who asked the rhizhiner what he had done. His answer ' I sent with him a little malach who put his foot on the scale and made it balance'. Scientific explanation anyone? And to be a thorough nudnik (David Ohsie would again call me a troll....) I would point out that the posuk says ואנכי הסתר אסתיר את פני. Why is there a double hiding? I Hashem was simply hidden, we would just look for Him. So He hides the fact that He is hidden; this is the scientific wall. And er Micha, just rereading your response. Please explain the difference between my unacceptable" basically pagan view of religion. As long as you think that the Torah is out to explain those parts of the world we can't explain," and your completely acceptable "science's goal is to provide a non-religious explanation of the empirical parts of the world. Torah is there to provide a religious explanation to the non-empirical parts." That’s all very well, but in practice science and religion do overlap. Most significantly in their interpretation of their own history, e.g. authorship of the Bible. What do you do then? RNS - sorry if this is going a but off topic. Yoni2: I would say that while Gould overstated the separation, it's still very real. And thus the two domains of explanation really only contradict at the periphery. But the topic of origins and other historical claims do contain overlap, or at least plausibly can. As I said, I think of these as peripheral. Which allows me to comfortably live with the questions unanswered. This is not the only domain in which I trust two systems of knowledge that each do well in their own target domains and yet have conflicting implications on matters they aren't really designed for. mechanics and relativity overlap at the edges and give conflicting answers in what is for each an extreme case. Each theory is so well proven in their core expertise that we know they're 99-44/100% correct. And we continue to use both - even to use QM to design chips to perform relativistic equations in our GPS devices. Skeptic: The pagan invents gods and myths to explain how the world works. Yahadus invokes G-d to explain how the world ought to work; what is the ideal I should be striving for. The topic each sets out to explain are quite different. To the pagan, scientific advance means a transition from paganism to atheism. Giving up Thor once lightening is understood; or replacing Aphrodite with a study of pheromones, dopamine, adrenaline and norepinephrine. To you, this means science is a threat to emunah, and must be denigrated. Both ignore the entire very Jewish idea that science is a primary exemplar of Divine Wisdom, and an attempt to read a second "book" of Hashem's Wisdom which exists alongside revelation. Scientific study doesn't challenge belief, it shows us "how manifold are Your Acts, Hashem!" Believing in a "God of the Gaps" is pagan, not Jewish. Fighting for "rigidly defined areas of doubt and uncertainty" (like Douglas Adam's character, Vroomfondel) shouldn't be necessary to preserve truly Jewish faith. As for the history of the word.... No English word was shaped by Jewish culture. Thinking in any language but leshon haqodesh hampers our ability to be holy. We can do better in Aramaic, Yiddish, Ladino or Modern Hebrew, but what you say about "pagan" is true of the entire vocabulary. Grammar too, for that matter. The Rambam you quote is being "scientific" -- he is presenting then-current Natural Philosophic theory. (As developed from Aristo's seed.) According to Aristo, all action starts with thought, which is why his (and the Rambam's and many other rishonim's) metaphysics is all about a hierarchy of intellects. The lowest intellect in the chain imparts impulse to an object, which then moves until the impulse is exhausted. Since the sun, moon and planets (the kokhavei lekhes) as well as the background of stars move eternally, the spheres in which they're embedded must have intellects continually adding impetus for their motion. Nothing pagan about it - straight 12th cent Natural Philosophy. True. Ever tried having a rational discussion with a Braekel? Hanosen lasechvi binah - might be a test if it is one! Thanks for your interesting comment. What would you say about prayer in that case? Are we believing in a "God of the Gaps" when we pray, by asking Him to do something that would otherwise be unexplained by nature? I didn't deny miracles. I denied the Jewishness of making one's belief system about miracles. God of the Gaps isn't about nature vs miracle, it's about someone who doesn't yet know the how of an event writing a mythical explanation for himself -- and then thinking those myths are all his god is about. So that science challenges belief. The gap isn't a gap in the universe obeying the laws, it's a gap in knowledge about the laws. Adding the fact that the very existence of laws screams the existence of their Designer, and you would have what I would consider one of the foundational principles of a Rationalist Judaism. This post will Braekel the internet! "I know that the Rishonim didn't believe that Divine Providence is so prevalent"
this isn't the forum for discussing such a profound subject, but i think you are either making a serious error in understanding the rishonim or in understanding Divine Providence. Divine Providence is not the same thing as hashgacha pratis (which indeed is rare). "Rare" overstates it. For example, while the Ramban does't believe HP applies to which way a leaf falls in the woods, he does believe it applies to everything a human experiences. The Or haChaim talks about HP vs free will, but what does that imply about the role of HP in most human events, wher there is more "wiggle room" between what other people do and what the person experiences? Universal hashgachah peratis is a new concept (assuming post-Kantian discussions of HP are even talking about the same thing as pre-Kantian ones), coined by the Ramchal (my own guess), the Besh"t (the last Lub Rebbe's attribution) or the Gra (the Sifsei Chaim's attribution). But saying that the common belief among rishonim was that HP is "rare" is taking things too far the other way. i believe that you are making the same error as NS in conflating divine providence with hashgacha pratis. ramchal states specifically that while divine providence is universal, hashgacha pratis applies only to humans. in fact, by definition, hashgacha pratis can only affect those with free will, so all non humans are excluded. divine providence = g-d animating the world and running it in such a way that it acts towards the purpose for which he created it. hashgacha pratis = g-d running the world in response to some one else's actions. by definition only beings with free will (ie humans) can have actions that are independent of g-d and require him to respond. Since the Or haChaim or the Ramban, the sources I was most thinking of when I wrote this (but we can add the Kuzari book V) actually use the phrase "hashgachah peratis", I don't think so. I agree that not all hashgachah is hashgachah peratis. Rishonim also spoke of hashgachah minis and hashgachah kelalis. and I would assume other forms of Providence I hadn't (yet) encountered, These would go under your definition of Divine Providence. But they are used in contrast to what most people receive in most of their life (or, as per the Ramban, all people get in all their life) -- hashgachah peratis. I also raised the suspicion that the Ramchal and acharonim since aren't really discussing the same topic. To a Scholastic rishon, HP is about metaphysics and whether nature is a created entity that can be given control. To an acharon living in Philosophy's more Modern period, the discussion is more experiential, and HP is more related to bitachon and how to live my live than abstract metaphysics. It could be less that the Ramchal (or Besh"t or Gra) invented a new theory of HP as much as their discussing the role the same term would play in a more existential model of the world. To quote the classic punchline: To your family you're Rav Kanievsky, and to your readers you're Rav Kanievsky, but to Rav Kanivesky you're not Rav Kanievsky. Would that it were so :). Here I was, eating chicken for dinner, and this post came into my EMAIL! I think this story confirms DF's comment on the last post about the different interpretations of "your miracle" vs. "my miracle". "Previous research indicated that subjects are not very surprised when reading coincidence stories, apparently because they regard the coincidence as one of many events that could have happened. This was true with respect to coincidences written by somebody else. However, there were indications that subjects found their own coincidences more surprising than those of others. The present study examines that egocentric bias and explores it further. In Experiment 1, a rotating design was employed in which the same story served, in turn, as self- and as other-coincidence, thereby controlling for the story's objective surprisingness. In Experiment 2, the coincidences occurred "spontaneously" in the course of the experiment, thus controlling for self-selection of subjectively surprising stories. Self-coincidences were judged more surprising than those of others in both experiments. The results suggest that the more personally meaningful the self-coincidence, the more surprising it is." Vincent: An act of G-d.
Jules: And what's an act of G-d? Jules: Hey, Vincent, don't you see? That s**t don't matter. You're judging this s**t the wrong way. I mean, it could be that God stopped the bullets, or He changed Coke to Pepsi, He found my ****ing car keys. You don't judge s**t like this based on merit. Now, whether or not what we experienced was an "according to Hoyle" miracle is insignificant. What is significant is that I felt the touch of G-d. G-d got involved. Your experience in no way impunes upon your rationalist position. Jewish rationalism allows for Hashem to occaisionally "ping" the situation, helping it along, for any number of reasons that only G-d knows. I see in this anecdote an expression of Hashem saying, "Yasher Koach, Natan, for all your hard work and hishtadlut." Almost as if Hashem wants to share in your work by opening a door for you. Is it heretical to say that Hashem is 'piggy-backing' (oh oh!) on your efforts to educate others while generating a Kiddush Hashem? That's the Jewish brand of ratonalism. Hashem likes to keep things natural. But we don't believe that G-d's intervention is impossible. With Teshuva, Tefilla, Tzdaka, and a hefty dose of perseverence, one get's an extra little push from above. Say you had prayed for a braekel and then you had gotten them, would you be more comfortable in your rationalism then to think it was divine intervention? If not, then why ever pray? And if yes, then why is it so different than if you hadn't prayed? "If I pray, then Hashem might answer my prayers if I am worthy and if that all fits into His/Her plan." (Rationalist approach). "If I say this particular combination of words three times at exactly the stroke of midnight than the Shekhinah will have no choice but to grant me health wealth and happiness." (Mystical approach). Read Kavvana: Directing the Heart in Jewish Prayer, By Seth Kadish. I don't know why there is even a pretense that we have a mesorah on chicken species. 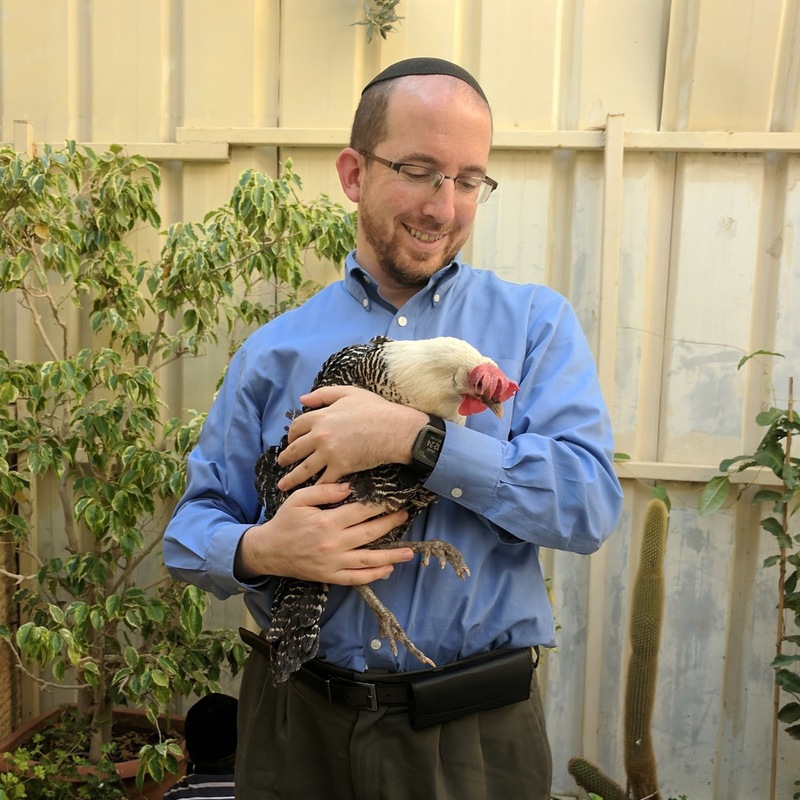 Do we have any idea what species of chicken they ate in the times of the Mishna? And then when the Jews migrated to Bavel, Rome, Spain, Iraq, Egypt, Germany, Russia, France, Italy, etc., etc., etc., they made sure to always eat THAT SAME BREED OF CHICKEN? I find that laughable . . . they saw birds that looked like "chickens" and they ate them. This whole "controversy" is a joke. You are misinterpreting the concept of mesorah, as NS did way back when attacking RYSE for invoking Mesorah against him. Yes, the mesorah is that everything bird that looks like a chicken is - get this - a chicken, and is kosher to eat. Yes, according to some rishonim, we should have a mesorah about a particular species before eating it, but my point is that it hasn't really been adhered to over the centuries, even with birds that are obviously not chickens, such as turkey. After some initial frum noises, everyone eventually ends up eating them, because they are very obviously not birds of prey. Weaver, you overstate things. Rav Dovid Lifshitz zt"l did not eat turkey. He celebrated Thanksgiving with a goose dinner. Admittedly that's rare for a Litvak, but there are large segments of the Hungarian community who rule accordingly. I think we should instead conclude that anyone who eats turkey shouldn't be asking the question, as the halachic unknowns were already resolved. in Beit Shemesh is because of a question over chicken kashrus. This story is making me reconsider my position. Add this to perek shira. פרק שירה: בראקל מה אומר: בִּקְרֹב עָלַי מְרֵעִים לֶאֱכֹל אֶת בְּשָׂרִי צָרַי וְאֹיְבַי לִי הֵמָּה כָשְׁלוּ וְנָפָלוּ. The Final Proof of the non-Existence of God was proved by a Babel Fish. "But," says Man, "the Babel fish is a dead giveaway, isn't it? It could not have evolved by chance. It proves that You exist, and so therefore, by Your own arguments, You don't. QED"
These 'amazing' things happen to everybody. A quick web search found these amazing things. 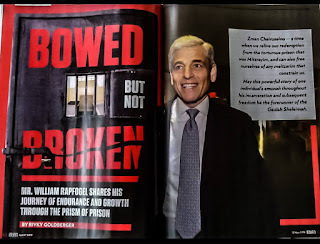 https://www.christian-article-bank.com/god-use-coincidences-to-speak/ Is Rabbi Slifkin serious ? And amazing things have happened to me. Plain old chance and a good dose of confirmation bias help explain these amazing stories. RYA has the best answer, but I believe the key word is "propriety". Are the Torah's laws like slavery or about Amalek moral? Certainly. How-so? Time to struggle. As far as scientific knowledge, there's no impropriety if you err. Well the Rishonim (Rambam and Ramban) say that the greater a person is the more hashgacha pratis he has in his life. Rabbi Slifkin must be doing something right! This might be why secular studies looking if there is Hashgacha are starting on the wrong foot. Natan, sounds like hashgachah pratis to me; no need to apologize for feeling that way! I really enjoyed your "chicken shiur" in Woodmere.